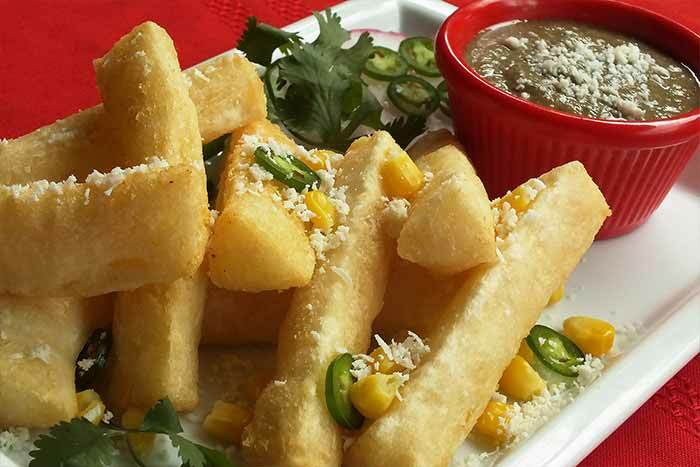 18 Oct Step Aside Potato Fries – Here Come Yuca Fries! There’s a new root vegetable in town, and like potatoes, it offers endless possibilities. Fried or baked, mashed or boiled…no matter how it’s prepared, yuca is a delicious and welcomed alternative to potatoes and with the added appeal of tropical nutriment and taste, this versatile vegetable is simply irresistible. Yuca, also known as cassava or manioc in the U.S., and by at least a dozen different names around the world, is a tropical root vegetable native to Brazil and the tropical areas of the Americas. Yuca has many of the same tuberous characteristics of the potato varieties commonly found in grocery stores, but with some key physical differences. Unlike the typical oblong shape of potatoes, yuca is longer and firmer with tapered ends. And instead of the relatively smooth, dimpled skin of potatoes, yuca has a fibrous, bark-like exterior, which is contrasted with a bright white, starchy interior. For centuries yuca has been an essential part of native life in Latin America and the Caribbean—it is referenced in several historical accounts, dating as far back as Christopher Columbus’ 1492 voyage—and today remains a core part of the regional diet. It also grows in other tropical areas around the globe, and it’s an important staple in the diet of people in India, Asia and Africa, where it has become a favored crop for its drought tolerance. Yuca comes in two varieties—sweet and bitter—though the sweet one is the one typically found in stores. Its nutritional benefits include low cholesterol, saturated fat and sodium, and in its raw state, it’s a good source of magnesium, potassium, Vitamin C, and fiber. It is also naturally gluten free. Yuca has gained a following recently for the unique qualities it brings to cuisine, and has been featured several times in renowned chef Anthony Bourdain’s hit show No Reservations. It’s not surprising that its versatility is part of what makes it so popular. An extremely versatile vegetable, yuca can be made into dough for chips, empanadas, fritters and tamales. It can be peeled, boiled and seasoned as an accompaniment to any protein dish, or cut into wedges and fried for an amazing alternative to French fries, the perfect accompaniment to any steak, pork or chicken dish. Yuca is widely used in Brazil to make cheese bread (pão de queijo) made with sour cassava flour or tapioca flour instead of all-purpose flour, a popular item typically available at Brazilian steak houses. So, if you thought the possibilities were endless with potatoes, yuca will open a whole new world for you and help you add more variety and flavor to your menu. For other creative ways to serve yuca, check out some of our yuca recipes. Learn more at https://www.micfood.com/. Have a foodie question? Ask our chef. Related Articles: Yuca 101: What is Yuca?